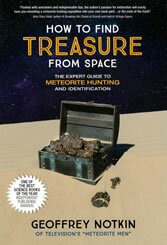 This book by Geoffrey Notkin, cohost of the Meteorite Men television series, is a comprehensive illustrated guide to recovering, identifying and understanding meteorites. It is a 6" x 9" paper back with 83 pages. See the table of contents below. What are meteorites and where do they come from?